Remember that house I was excited about? Well, we made a bid on February 7th. On February 10th, when I was stuck in jury duty, we learned that the bank had accepted a different [higher] offer. So that was that, and we were really okay with the outcome. Of course, we had checked the “Seller may hold [our] offer as a back-up to accepted offer,” box on the HUD contract form, so there was always the chance that something could fall through with the other buyers. Matthew more or less dismissed this possibility entirely. While I was not hoping for it, nor even consciously thinking about it, I also didn’t think the case was closed until we found out how much it the final selling price. Last Friday, exactly four weeks after we placed our bid, our realtor contacted Matthew saying that the contract with the other buyer had, indeed, fallen through, and the house was ours if we wanted it. The timing seemed almost like fate — just when we decided we would be in this apartment for awhile, things shifted: 1) I finally took the moving boxes to the basement and 2) Matthew commented just the other week, when I bought furnace filters, that maybe we wouldn’t be here to use the second filter. We more or less decided that it was a go, planning to meet with our realtor to walk through the house one more time on Saturday morning and then complete the paper work. We were going to buy a house. In the suburbs. Holy moly. We both spent Friday night tossing and turning, getting very little sleep, in anticipation of the fact that we were really going to buy a house, with all of the good and not-so-good (hmm, we’re going to have to buy a lawn mower . . . and USE it) implications. While the house appeared to be [close to] livable already, we already had a mile long (at least cost-wise) list of renovations/alterations to the property: tree removal (to improve sun for gardening) and possible terracing of the sloping yard, taking down a wall to open the kitchen to the front room, kitchen remodel, ripping out carpet and refinishing wood floors, installing a shed or lean-to for bike storage (no room for a garage), and possibly adding a door for direct access to the basement. Probably at least $30k of improvements. Saturday morning, we stopped by our credit union on the way to the house, to get a cashier’s check for the deposit we would submit with the contract. 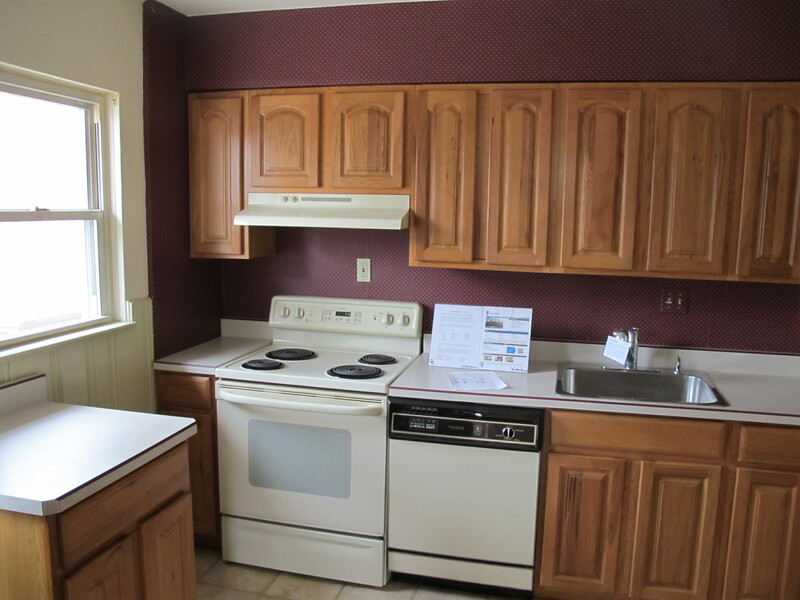 We got to our the house, and I started snapping pictures of the kitchen, so we could start planning the remodel. We had already been through the house with Matthew’s mom and her partner (a restoration carpenter), but Matthew’s dad had yet to see it. When you’re making a decision/purchase as big as a house, the more eyes the better. As I finished up the kitchen pictures, Matthew’s dad and his wife arrived. And our “good enough; let’s do this” house started unraveling. First, they noticed the musty smell and brought up mold concerns. Matthew and I both have very sensitive noses, and we had noticed this before, but, with our rose-colored glasses on, we attributed it to the house having been closed up for almost a year now. Then, I noticed that the most recent visit recorded on the sign-in sheet had “water on floor” as the reason. 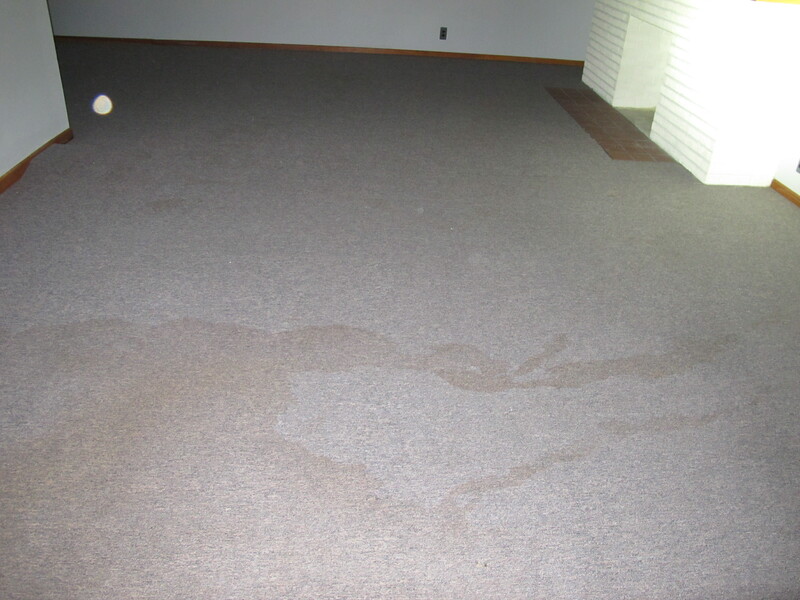 I headed to the basement, which has some mostly finished space . . .
. . . and found these water stains. We had either missed them on our previous visits (would have been easy since the power was off and we were viewing by flash bike-light), or they were new. Now, a little water in a basement is nothing new, but, since the upstairs living space is a bit cramped, we were planning to really use this downstairs [basement] area, as living space, not just storage. It prompted us to really look at things. While the house is not at THE lowest point on the block, it is not too far off. There has been, and will continue to be, significant water running across the property. Certainly not a cheap fix if possible at all. 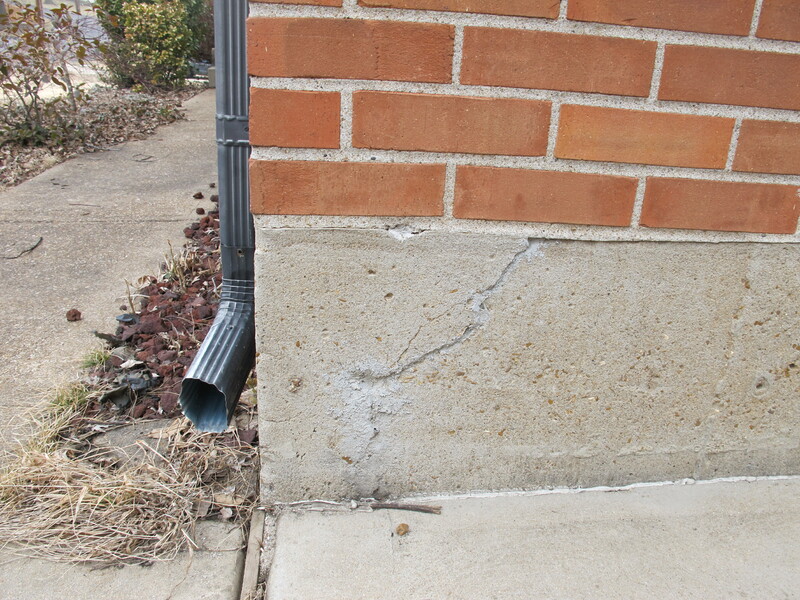 We found possible evidence that the water pressure has caused recent shifting in the foundation, a big red flag. It seemed likely that there were significant issues that would cost significant money to fix/improve (if it was possible to do so at all). With the offer we made, combined with the improvements we already planned, we did not feel like we could put more money into this house. Because it is a foreclosure, we could not adjust our offer to offset these additional costs. So, we followed our gut and walked away. While we feel we made the right decision, it still made for a rough Saturday, especially when combined with sleep deprivation, neck pain, and gray, chilly weather. I admit to a temptation to call this whole thing off, and proclaim myself a renter for life. But, since we want a large garden where we live, along with some other benefits of home-ownership, we will dust ourselves off and continue this slow, plodding search. This entry was posted in My Life and tagged house hunting. Bookmark the permalink. You dodged a bullet. Or maybe several of ’em. I hope that you are back to full health soon!!! Anyhow, before I bought my house I had an engineer do an inspection for peace of mind. He was someone my Realtor recommended – it cost a bit more than a standard inspection but it was well worth it. Yes, if we had decided to go forward with an inspection, we would definitely have paid for a structural engineer to be involved — worth the upfront investment, given what NOT knowing could cost in the long run!